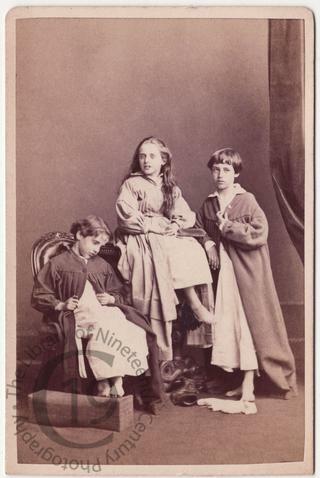 A carte-de-visite portrait of three barefooted children dressed in what appears to be nightwear. Identified verso as 'Muriel, Atta and Claudie Hay', these are three of the eight children of George Hay-Drummond (1827-1897), from 1866 the 12th Earl of Kinnoull. Their mother was Lady Emily Blanche Charlotte Somerset, daughter of the 7th Duke of Beaufort. 'Claudie' is the Honourable Claude George Drummond Hay (24 June 1862 - 24 October 1920). 'Muriel' is Lady Muriel Henrietta Constance Hay (14 August 1863 – 2 January 1927), who later married Count Alexander Münster. And 'Atta' is probably the Honourable Alistair George Drummond Hay (18 April 1861 – 15 April 1929), who later married Camilla, daughter of Algernon Greville, 2nd Baron Greville. Photographed by Collier and Park of Inverness in Scotland.